Jawahar Circle hosts #WowVenue Verified Venues, ranging in capacity from , and priced between . There are Banquet Halls in Jawahar Circle. Jawahar Circle features Small Banquet Halls and Large Banquet Halls that are ideal Venues for Private Parties, and AC Banquet Halls and Hotel Banquets that are perfect Venues for Weddings. Top Banquet Halls in are . Banquet Halls in Jawahar Circle have a capacity range of , and a varied price range from , depending upon the location and type of Venue. Jawahar Circle harbours some of the Best Luxury Banquet Halls too, such as . Jawahar Circle features Popular 5 Star Hotels like . These Venues offer Lawns + Banquet Halls, ranging in capacity from , and priced between . WOW Venue’s Recommended 5 Star Hotels in Jawahar Circle like allow Indoor & Outdoor Catering, Cocktails & Hard Liquor, and Outdoor Music too. These are excellent for any kind of event - be it Weddings, Conferences, Receptions, or Birthday Parties. Resto-bars and Lounges are perfect Venues for Outdoor Parties and Cocktail Parties. Jawahar Circle houses some of the Top Lounges and Rooftop Venues like , ranging in capacity from , costing between INR . From Budget-friendly #WowVenues in Jawahar Circle to Premium Luxury #WowVenues in Jawahar Circle, avail up to 30% off on the venue of your choice at WOW Venue! BOOK NOW! Jaipur destination weddings are known for its elegant forts and palaces, havelis and historical sites, adding a royal and regal touch to all weddings. Celebrate your love with a memorable wedding in a 5 star hotel in Jaipur, which is entrenched in the cultural legacy of India’s Pink City. Located near the famous Jawahar Circle Garden which is well-known among the locals, Jaipur marriot is a beautiful wedding venue in Jaipur with stunning architecture and well-lit chandeliers that make any wedding function a grand affair. With over 43,000 sq. ft. of internal and external spaces, Jaipur Marriott are ideal for conventions, meetings and weddings. From hosting a grand birthday party in Jaipur to conducting or celebrating a corporate party in Jaipur. 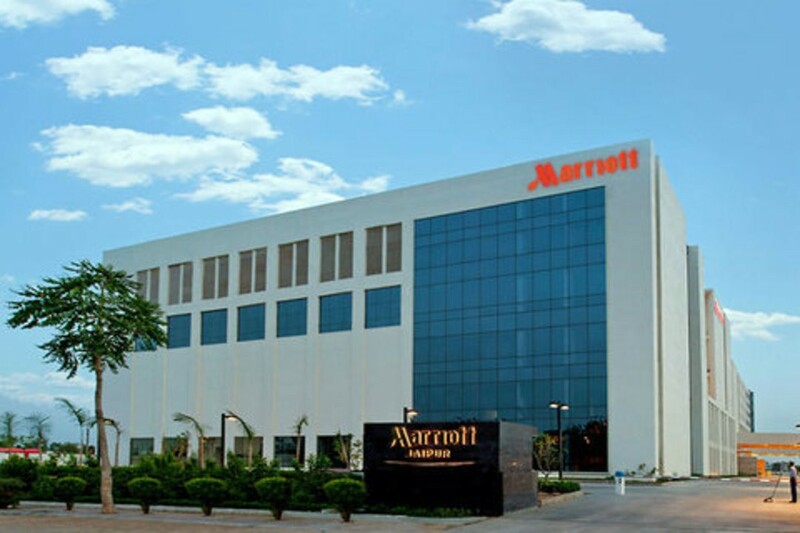 Rich in culture, tradition and hospitilaty, the Jaipur Marriott Hotel welcomes guests with refined elegance, contemporary amenities and a prime location near Jaipur International Airport. The lavish décor of the venue gives a special touch to your big day and two of their largest wedding venues can accommodate up to 1,500 guests, each for unforgettable receptions. A well-known name in the hospitality sector, experience the winning combination of traditional luxury and modern convenience at the Jaipur Marriott Hotel. With 31,000 sq ft of flexible meeting space that comprises of 2 ballrooms, 6 break away venues, meeting rooms, and a lawn to accommodate over thousand people, it makes for an ideal destination for all gatherings and events.